Below I’ve made a selection of the coverage in the conviction that it might also interest readers outside Russia. As well as often being very funny – newspaper editors didn’t miss the chance to enjoy themselves with the headlines – it’s surely also significant for the upcoming FIDE Elections (and court battles), where reputations and government support are key factors. It seems unlikely that the Russian media would go so far if they felt Ilyumzhinov still had the backing of the Kremlin. Kirsan Ilyumzhinov is leaving his post as President of Kalmykia. From October on he’ll be an absolutely free man, able to fulfil his old dream – to become a cosmonaut or enter a Catholic monastery. The citizens of the poorest Russian republic will also be given a chance – after 17 years of the rule of the businessman-dictator-dreamer – to obtain a new Head of the Republic. Who will it be: the head of the regional branch of “United Russia”, Anatoly Kozachko, the deputy chairman of Kalmykia, Badma Salaev, or someone else. That will become clear in the coming days. One thing is clear – the “Kirsan era” is coming to an end. 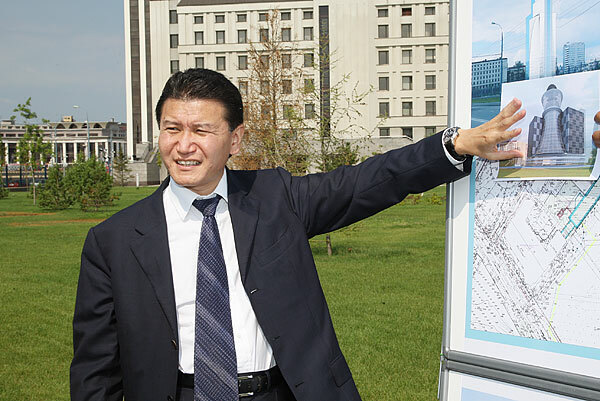 The main puzzle with Ilyumzhinov remains the answer to the question: how did he manage to stay in power for 17 years? After all, claims began to be made about the Kalmyk President’s resignation as early as 1993. At the time he was an ardent supporter of the Supreme Council in the confrontation with Yeltsin. But after the Council’s defeat he quickly corrected himself and even began to rebrand his “Kalmyk Khanate”, Khalmg Tangch, as a modest republic. It’s possible that Ilyumzhinov was saved then, however blasphemous it sounds, by the first Chechen War. It wasn’t the time to light another fire in a steppe republic which bordered on the North Caucasus. Meanwhile, according to the latest statistics (for 2009), in terms of average monthly income the republic is in 81st place out of 81 regions, and is 80th in terms of unemployment. In general, the businessman-dreamer didn’t work out as a “father of the people”. So they decided to give him the chance to deal with what he loves more than anything else – studying “black holes” in space. It’s better than creating them on the Earth. Unsinkable for 17 years (he’s run Kalmykia since 1993), Kirsan Ilyumzhinov had no other choice left, as he understood the definite hints from Moscow very clearly and, so as not to be completely excluded from affairs and instead be able to take up some honourable niche, the President of Kalmykia chose the preferable scenario of retirement. The election of Kirsan Ilyumzhinov as President of Kalmykia in 1993 was a landmark moment. The candidate went to the elections openly declaring that he was a wealthy man. Millionaires in power, openly declaring that they were millionaires – in 1993 that was a novelty for the country. In an interview for the “Versiya” newspaper the leader of the Kalmyk opposition and President of the “Security and Development” Fund, Alexander Ledzhinov, told of how Ilyumzhinov went for his fourth term in 2005. Ledzhinov claimed that Ilyumzhinov paid a “certain amount” for his re-election to someone in the Russian Federation President’s administration. At the same time civil disobedience broke out in Kalmykia itself back in 2004, during which one person died and a few hundred were beaten by the police. A few years later he was running an array of banks and countless companies, after which rumours began to appear in the media that Ilyumzhinov had taken Russian government loans for the purchase of wool – more than 10 billion roubles – which then disappeared somewhere. Similar scandals have pursued Ilyumzhiminov over the course of his whole term as President – they concern both him personally, and the region he heads, though nothing has ultimately been proven. 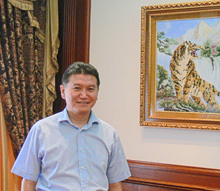 […] Over time the name Ilyumzhinov began to become increasingly rare in the political media, while simultaneously appearing in other areas not connected directly to politics. Slowly but surely the Head of Kalmykia turned from one of the youngest and richest rulers of the Russian regions into an eccentric authority figure (“freak”, as his detractors put it), delivering journalists news gifts that they could only dream of. […] A favourite phrase, migrating from one Ilyumzhinov interview to another like a steppe nomad is on how a man has 108 lives. “I’ve been reincarnated 69 times. I also lived during the time of the Inquisition. But it’s right now that I feel myself most at home”, Ilyumzhinov said at the beginning of 2009. If his calculations are correct then he’s still got 39 lives to go, despite the fact that his political life is no doubt over. Not bad for a man who knows aliens, is it? The citizens of Kalmykia began to celebrate the coming end to the rule of the Head of the Republic of Kalmykia, whose authority runs out on 24 October. The initiative to organise parties for such an event came from the users of local internet forums and representatives of the opposition. So the Head of Kalmykia’s replacement can only hope that Ilyumzhinov retains his post as President of FIDE. At the very least, the departing Kalmyk leader has declared that he’ll try to do everything possible to make that happen. In that case, at least at first, the majority of his efforts will go into the struggle with his opponents within the chess federation who are now actively opposing Ilyumzhinov and proposing Grandmaster Anatoly Karpov as his replacement. And then Kalmykia can breathe more easily. Now he’s simultaneously fighting to be reelected to the post of FIDE President. Having attended the opening of the gasification of one village back in mid-July he spent one and half months traipsing around the whole world – the Middle East, South America, Asia. The Head of Kalmykia only returned to his homeland on 31 August, and on the 2 September he again flew off. Meanwhile his co-workers in the administration claim that in fact Ilyumzhinov is a workaholic and works deep into the night when he’s in the republic. According to Badmaev, the moment Ilyumzhinov is deprived of all his posts – as Head of the Republic and as President of FIDE, the opposition will start a campaign for “criminal procedures” against him. “We’ve got qualified jurists and believe me – there are things to put Ilyumzhinov in prison for. During his rule he’s done enough for a few people”, the opposition politician said. In order to retain his weight in the socio-political life of the country, and to avoid possible criminal investigations, Ilyumzhinov, understanding that his presidential days were numbered, will, it seems, put all his efforts into the fight for the FIDE leadership. After all, the heads of international federations also have “legal immunity”. Therefore Anatoly Karpov, also campaigning for the post of FIDE President, today represents a greater danger to Ilyumzhinov than all the opposition combined. The departure of such a well-known government figure is always an event. Yes, I’ve worked for 17.5 years, 20 years in politics. But I’m a Buddhist. There’s nothing eternal under the moon. Now, I thought: why go for a fifth term? If I said: I want a fifth term then you journalists would have been upset. What are you planning to do now? You’re only 48. I’ve got a flat in Elista and I’m not intending to go anywhere. My main project now is to work for the post of FIDE President. I’m trying to organise a pastoral visit by his Holiness the 14th Dalai Lama, so that he can bless our Central Buddhist Temple in Elista. While two years ago I started to build a temple of the Great Martyr St. Panteleimon with Patriarch Kirill – that also needs to be finished. “Do you believe in God? Go to church. Billions of people believe but no-one has seen him. NASA registers four thousand contacts a year. I take the phenomenon seriously. In our galaxy there are 54 systems like the solar system, and even according to probability theory it’s impossible to say that we’re alone in the Universe… I’ve dealt with a lot of politicians, and they also understand it. We should realise that we’re not alone in this world. “They’ve suggested I take part in a few commercial programs and I’ll choose a large commercial project, besides my public welfare projects, so I’ll be able to sponsor them”. “Guys, I’ll become the president of the club “Uralan” myself! If the club next season doesn’t get into the higher league I pledge that I’ll resign my post as FIDE President, as it will have been a complete failure for me. I’m ready to give you as much money as you need. But now in return I need your guarantees that you’ll also be risking something in your life, accepting this money”, Kirsan says. They were all discouraged and promised that they’d work as hard as they could, that they’d try. One more anecdote, about classmates. An old man caught the goldfish. It asks: let me go and I’ll fulfil all your wishes. Would you like to go home and find a Mercedes 600 standing there? No, I don’t want that! Do you want a five-storey villa with a swimming pool and a beautiful wife? I don’t want that! Or perhaps a mansion in Paris, a Rolls Royce and Claudia Schiffer as your wife? No, I don’t want that either, the old man rejected the offer. So what do you want, the fish asked in amazement. The old man thought and said, please make me a classmate of Kirsan’s! An anecdote, undoubtedly, to the point: as all of Kirsan’s classmates are employed in Kalmykia in positions of authority. Ah, it’s a shame that I didn’t study in school with Kirsan Nikolaevich! The following article is more solidly pro-Ilyumzhinov, and includes a long interview. What faith do you personally follow? If Karpov didn’t exist you’d have to invent him. He has no program, no ideas, while 170 countries around the world is no joke! You don’t sit at the controls of a jet, or in a dentist’s chair, knowing that instead of a doctor there’s Vasya the plumber. Therefore I consider his competition frivolous. Finally, Anatoly Karpov gave an interview where, among other topics, he discussed the legal action brought by Ilyumzhinov against him. You don’t need to be a highly-paid lawyer to spot that this week’s press coverage is unlikely to have done Karpov’s case any harm. On the 15 September in Moscow legal hearings will be held for the case brought by Ilyumzhinov, who accuses you of libel. Not of libel, but of causing moral harm to his fantastic reputation. How well-grounded are his accusations? It’s sufficient to open any site and look at what even the pro-Kirsan press has written over the last 15 years. It’ll become clear that his name carries with it a trail of corruption scandals, in which not only Ilyumzhinov, but also his team, are mentioned. Recent evidence for that is the detention of the Deputy Prime Minister of Kalmykia, who Kirsan appointed by his own decree as the chair of the commission to fight corruption. The Kalmyk procurator appeared on Channel One and announced they had the necessary proof that this Deputy Prime Minister was a member of an organised crime organisation. In the same report they said that the Deputy Minister for State Property in Kalmykia was also detained and under investigation for selling property on the cheap and pocketing the difference. It’s no wonder Kasparov couldn’t stand to be a part of FIDE in 1993 when Kirsan was elected. I wonder whether Garry Kimovich would consider a return to play with Kirsan out of the picture and a stable candidate cycle?